Google kept the developer love rolling at Google IO this morning as it introduced a new way for the group to see how their work looks across different layouts and configurations. 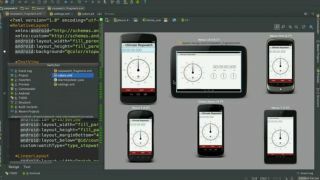 It's called Android Studio, and offers live rendering during run time. Devs can see how their work operates on smartphones, tablets and more. "This is a fully featured IDE right from the get go," said Hugo Barra, vice president of Android product management. Being a developers conference, Google laid out plenty of tools, updates and features for the dev-heavy crowd during this morning's keynote. In addition to Android Studio, Google also introduced Google Play game services, what the company envisions as the groundwork for building a gaming platforms. The idea is to help developers make their games more social through things like leaderboards and more powerful thanks largely to cloud integration. The company also rolled out a number of location and messaging APIs today as well. We'll have more from the conference throughout the week, so tune back in for all the latest.